A lot of you know one of Anna's many nicknames is "Anna Banana" so I thought it'd be cute to dress her as a banana and Travis and I as her monkeys. However, my costume changed entirely once my two volunteers for girls nights and I decided to go as a trio. You'll see below who we chose! 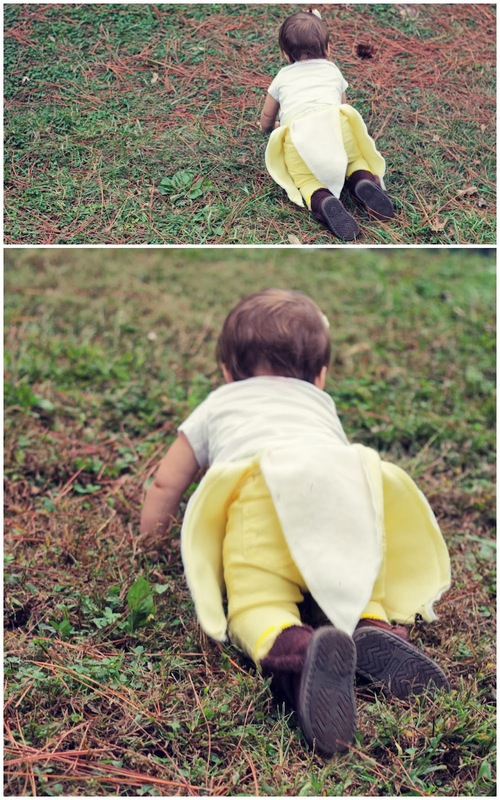 Cutest banana I've ever seen! She saw an airplane. She loves them! 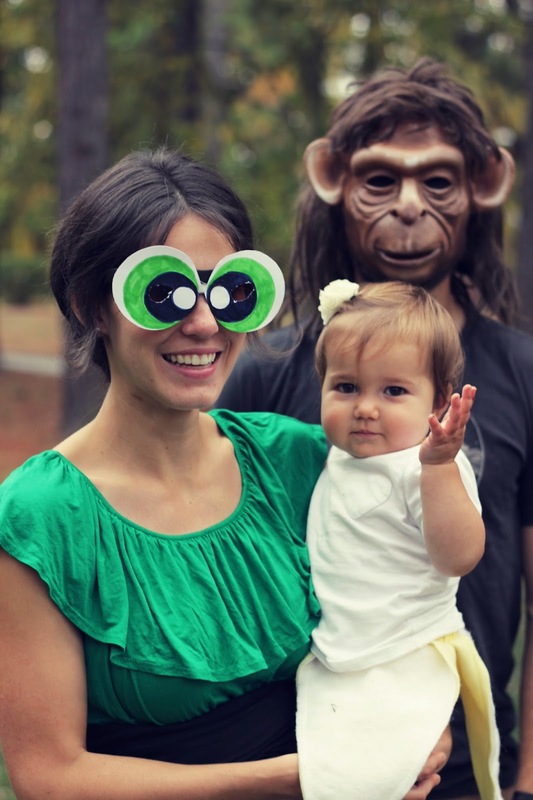 Here's the thing, she didn't like Travis' monkey mask and mullet (I mean, who would?!) Like, she hated it. Wouldn't even look at him. 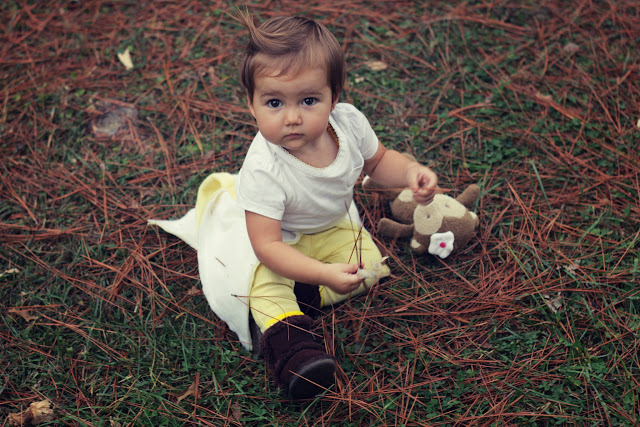 So we improvised and got her one of her monkey stuffed animals to take pictures with. 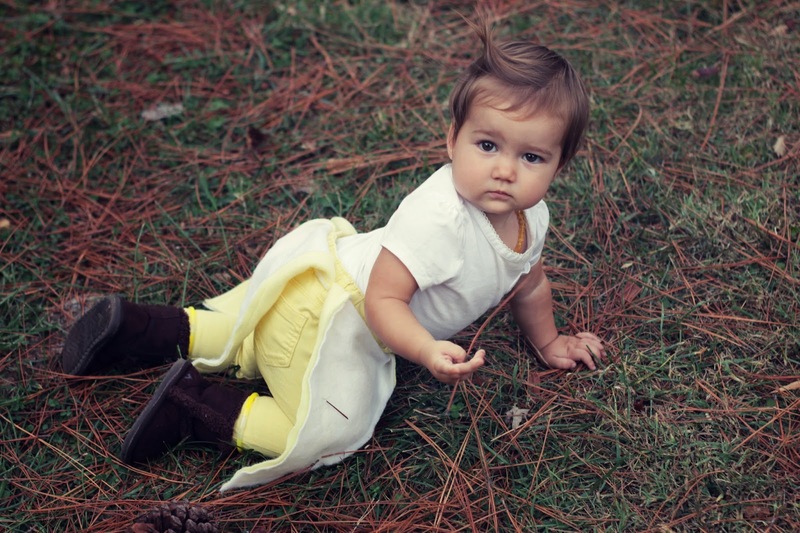 And the hairstyle below, we call that the "pulled hair bow out of hair" look. Look at that Zoolander pose! Yes, I made her costume. Yes, it may look more like a fairy or a flower but hey, homemade costumes are always the best! My mom used to make ours, Travis (the creative one) used to make his, so I felt it only necessary I make Anna's. 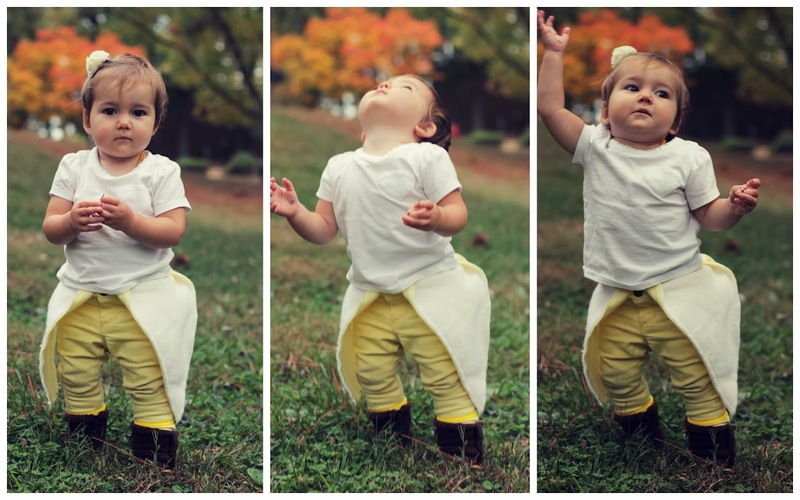 I think these shots below make her look most like a banana. Our girls night girls are obsessed with the Powerpuff Girls. Do you remember the show? 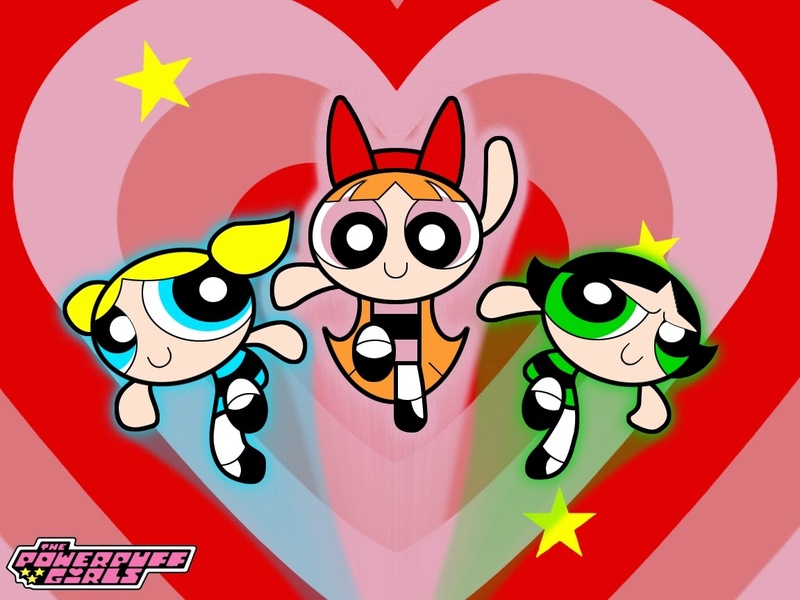 When I was in middle school my friends and I loved the Powerpuff girls, so much so that my AIM name was "blossom503". I guess you could say I was a little obsessed too. When our girls started calling us by the Powerpuff Girls names we knew exactly who we were going to dress like for Halloween! Too bad most of our girls were confused and it took a few tries for them to guess who we were! 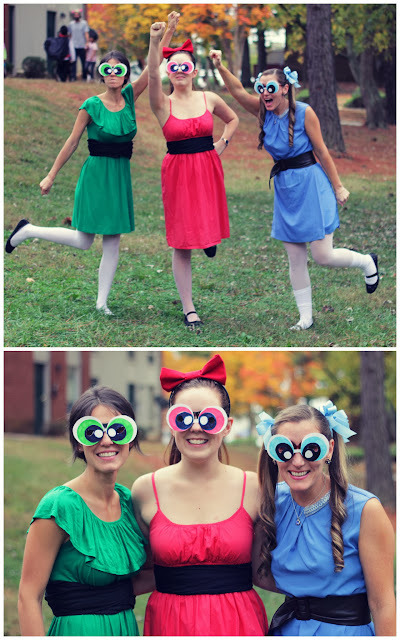 But we did get a random group of adult women ask if we were the Powerpuff Girls, so...YES! Don't worry, Anna, Mommy and the Powerpuff Girls will save you!